I responded to each question with simple, straightforward answers, thinking it was a breeze. Then I had heard someone shout from the back of the room, “So you think you’re perfect?” I was puzzled. I felt blood rush to my face and I broke into a sweat. The second it took for me to respond felt like an eternity. I’ve made this 20-mile trip between my parents’ homes for the last decade, four times a week, ever since they divorced when I was seven. I must have taken it more than a thousand times. Sometimes I dreaded getting into that car, and resented my parents for putting my older sister and I through the circular logic that moving us back and forth will make our lives normal because we see each parent often, but moving back and forth isn’t normal, unless they make it normal, which isn’t normal. Now I know it makes sense because normal isn’t ideal, normal is the unexpected and the crazy and the unforgiving. I now realize that those rides are the consistency amidst the madness. Looking out the window and down to the lane reflectors I think… about how on Friday’s basketball game my jump shot was off because I was floating to the left, about how I’m excited to see my dog and cat, about how upset I am because of Yossarian’s predicament, about how I’ll miss my dad, about how veterinary medicine is fascinating, about how I needed to study for my chemistry test, about how I will work harder to get into my dream school, and about how I’m glad that I get to take a nice nap before I go to mom’s. It was those hours I spent thinking silently to myself when I learned more about who I am, where I envision myself going, and what my role is in this world. Sitting in the front seat, I’d take a moment to look back to see that same dancer in white, however faceless, nameless, and abstract, gave me a sense of comfort. That even though I wasn’t really ‘home’, I still was, because home isn’t simply where you rest your head, but also where you have the security to dream inside of it. As I ran past the one-mile mark, I felt a little woozy, but I might have been just tired. I stopped briefly to measure my blood sugar. While other runners glanced questioningly in my direction, I poked myself with the lancet, squeezed my finger, and collected a tiny droplet of blood. uncomfortably close to a level where I could pass out or have a seizure. Disappointed, I stepped off the racecourse and drank a juice box, waiting for my blood sugar to recover. This was the third race where I was forced to the sidelines. I found out I was a type I diabetic at age ten, but after a few days spent in the hospital learning how to manage the disease, I returned to my life. However, everything had changed. Being a diabetic since 2003 has forced me out of many activities, but at the same time it has pushed me to be independent, to value my health, and, most importantly, to keep trying in the face of obstacles. Every day, several times a day, I count my carbohydrates, inject my insulin, and measure my blood sugar. I’ve done this ever since my diagnosis. How many grams of carbohydrate in a slice of bread? About fifteen. In a can of coke? Around thirty-eight. I have to know the exact amounts of sugars in everything I eat in order to dose my insulin correctly. Along with the food, I take my exercise, my emotions, and even the time of day into account. I’ll get low blood sugar when I exercise, stress can raise my levels, and I tend to go low in the evening. I remember the first time I gave myself my own insulin injection. Only a few months after being diagnosed, I woke up hungry, but unable to eat until I received my dose of insulin. Normally my mom would have done it, but she had gone for a walk with my dad. However, I wanted breakfast. I gathered my courage and did what I hadn’t been able to do before: stuck in the syringe. A few minutes later, I smiled to myself with pleasure as I ate my cereal. At that moment, I knew I could get through anything. The one thing I never imagine it would prepare me for, however, was suddenly facing life alone. In 2008, during my freshman year of high school, both of my parents passed away from cancer and I moved to Southern California to live with my aunt and uncle. Although I still struggle with this loss, I know the lessons I have learned from handling a chronic illness will help me face my current challenges. Diabetes hinders me in many situations, such as cross-country races, but it never stops me. While I could let the loss of my parents slow me down, I refuse to lose the vivacity for life they instilled in me. In order to accomplish this, I use the independence and self-awareness I’ve gained from my diabetes to have the freedom to live happily. As I stood on the sidelines during that recent cross-country race, waiting for my sugars to slowly rise to normal levels, I reflected upon my recent losses. It was time to move on, I thought. I rechecked my blood sugar and saw that I had reached a safe level to continue exercising. By this time, all the other runners had passed me. I didn’t win, but I fulfilled my own personal goal: finishing the race. 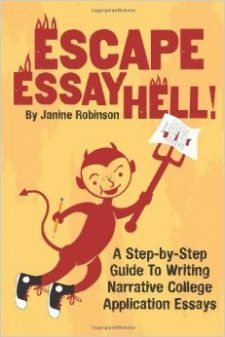 In my writing guide, The Writing Survival Kit, I share some excellent sample essays for college applications. In this post and future ones, I’m sharing some of them with you. Whether you are just starting to brainstorm a topic for your own essay, or already are working on a draft, reading what other students have written can spark ideas and provide inspiration for your own pieces.